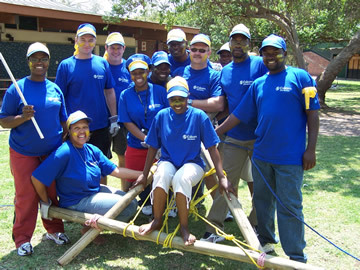 No one is immune from the fun in Team Survivor, SA TEAMBUILDING’s exciting adventure-based team building program. Inspired by the popular TV show, Team Survivor is geared to challenge team members individually and as a tribe to reach for new heights of success. Team Survivor begins with the ritual of the tribal council, where each group creates a unique tribal identity to set their team apart. Using building materials including colourful water-based body paints and an assortment of props, each team must create a tribal name, flag and tribal chant representing the values and power symbols most important to them. Teams successfully complete a balance of physical and cerebral activities designed to integrate, collaborate and build cohesive teams. Points are awarded to teams nominated by colleagues for valuable contribution. Tribal Council Jury determines the ultimate survivor team (no voting off).This event is fun, energizing, challenging and is guaranteed to produce a lot of laughs..